While researching the history of the Rose Hall Estate in Jamaica – not the Rose Hall at Montego Bay famed for the (totally fictional) White Witch, but the one in St Thomas in the Vale – I came across a little book called “At the Three Sugar Loaves and Crown“ by Owen Rutter (1889-1944). It was published in 1938 and tells the near three hundred year history of Davison, Newman and Company, which became the West Indian Produce Association, and made a fortune for its owners. In Creechurch Lane, off Leadenhall Street, stands an old shop with a sign such as the merchants of the City were wont to display two centuries ago; three golden sugar-loaves surmounted by a golden crown. . . . .Within the shop you may buy anything from sugar to cigars, from Trinidad chocolate to Jamaica rum, from tea to treacle. . . If the shop did not disappear in the Blitz it must certainly have succumbed to the bulldozers long since, although the church of St Katherine Cree that gave its name to the lane survived both the Great Fire of London and the Blitz and still stands at the corner of Leadenhall Street. It boasts a fine rose window at the eastern end, supposedly modelled one in old St Pauls, and is now a Guild church without a parish ministering to the world of finance and commerce that surrounds it. The eighteenth century was the great heyday of the company when it was joined by Monkhouse Davison from Cumberland, made free of the Grocers’ Company in 1738. By the time he became a partner sometime in the mid-eighteenth century, Rawlinson & Davison, were ‘Dealers in Coffee, Tea, Chocolate, Snuffs, Sago, Hartshorne, Virmicelly, Morells, Truffles, Starch & Blue, with the best of all Sorts of Grocery and Confectionery Wares at the lowest prices’. Tea from the East was traded out to America and the Caribbean; rum, sugar, chocolate and coffee from Jamaica and tobacco from the southern American plantations were brought back to London. The range of teas stocked by Davison and Newman was extensive and included Hyson, Singlo, Congou, Souchong, Pekoe, Padree and Bohea. It was a consignment of tea from Davison and Newman that joined others scattered in the waters of Boston harbour at that most famous of tea parties in 1773. But there appears to have been a second incident the following year which resulted in a number of English merchants petitioning the King in relation to further losses of tea. You can see their petition here . Davison and Newman had sent sixteen chests of tea on a ship called the Fortune, consigned to Henry Lloyd a merchant in Boston. Five of the men petitioning the King had underwritten the insurance on the tea for four hundred and eighty pounds. On Monday the 6th of March 1774 in what seems to have been a repetition of the first tea party the previous December and the day after the ship arrived in Boston, a large number of men, many disguised as Indians and armed with axes and hatchets, dragged twenty-eight chests of tea including those belonging to Davison and Newman out of the ship’s hold, broke them open, and threw the tea into the water. The insurers had paid out the equivalent of about £48,000 in today’s money and understandably were hoping for compensation. If tea had been the only or even a major part of the trade of Davison and Newman these losses would have been more serious, but they traded in a very wide range of goods and had a portfolio of property in London. In 1789 they diversified even further and bought a 4/18 share of the Rose Hall Plantation in the Parish of St Thomas in the Vale in Jamaica. The land was owned by Sir Charles Price who had acquired it from the Rose family and now leased it to Sir James Esdaile and Robert Cooper Lee, who each held a 7/18 share. The Lee family continued to hold their share of Rose Hall into the mid-19th-century, but the Davison and Newman interest ended in 1834. Davison and Newman held a copy of the slave muster book quoted by Owen Rutter. In 1784 the slaves included 82 men, 72 women, 39 boys and 27 girls. Two 6-year-old girls called Ebony and Lavinia were employed to weed among the sugarcane and were described as being ‘healthy’. Eleven year old Flora was a field hand, which means she was expected to do the harder work of preparing the ground and planting canes, “but now attends her mother who is blind”. After the deaths of Monkhouse Davison and Abram Newman the company was taken over by William Thwaytes who had already worked for it for twenty-five years and would do so for another thirty-five. Sadly however in the latter years of his life he seems not to have controlled the company very effectively and at his death the City properties had become dilapidated and he had even failed to have his will witnessed. As a result all his estate went to a nephew, including his share in the Rose Hall Plantation, rather than to his wife, and when a buyer could not be found for the company four junior employees undertook what we would now call a management buyout. They borrowed £8000, acquired the three houses in Fenchurch Street and carried on the business, turning it once more profitable. 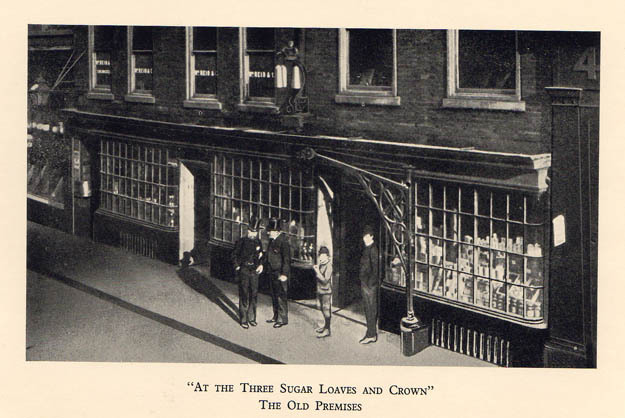 The original premises from which the company had traded for two hundred years were demolished in 1890 and the company moved to 57 Fenchurch Street and eventually to 14 Creechurch Lane where in spite of the change of name to the West Indian Produce Association it still displayed the sign of the Three Sugar Loaves and Crown.